How to Survive in the North, by Luke Healy. Nobrow Press, November 2016. 192 pages. $22.95, hardcover. 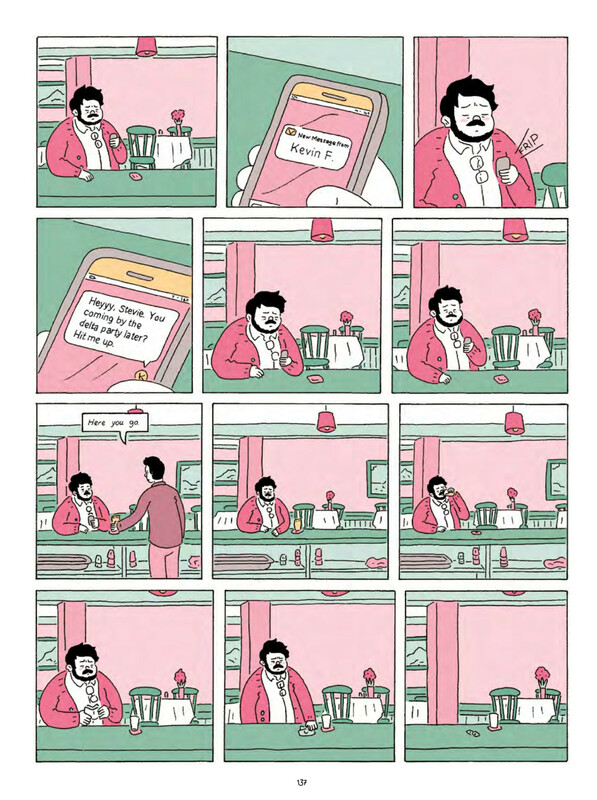 Like the frigid plains it’s set in, Luke Healy’s graphic novel How to Survive in the North is quiet and full of introspective beauty, placing its cast of vibrant, believable characters against a looming red sky with nothing but their bodies and misty breaths, speechless in the face of their shared predicament. And the book is fierce: howling in the biting cold as it examines the frigid snap of death that tears at the flaps of an explorer’s tent, the existential crisis of a modern man and his forbidden love, and the crushing loneliness of an exploited woman. Don’t be fooled by Healy’s fanciful, charming artwork, though; this book is sublime, as terrifying and exhilarating as it is beautiful. How to Survive in the North doesn’t pull any punches, and it finds strength in the willingness to linger in quiet moments, just moments before looking death in the face. *Ed.’s Note: click images to see larger size. Weaving together three separate narratives—two true-life accounts of dangerous Arctic expeditions in the early twentieth century, and one fictional tale of a twenty-first century professor risking his career and his reputation in a surreptitious affair with a student—How to Survive in the North is surprisingly dense, calling upon readers to juggle not only three distinct, yet thematically similar stories—shifting between them without warning—but also the ways in which narrative reflects, alters, and echoes within the other two. Ada Blackjack’s dealings with the exploitative Maurer transitions easily into Sully’s meeting with a hardnosed dean, which bleeds just pages later in Bartlett’s attempts to calm a rowdy crew. These transitions are abrupt, occurring page to page, but Healy skillfully picks those moments of emotional resonance that allow a reader to make the jump through time and space. Each of the three tales begins in media res, at a dire moment when, referring to the book’s title, the characters are at the very cusp of death and despair, explicitly not surviving in their respective norths. The first begins in 1913 as explorer Robert Bartlett lies on a sled in the vast Arctic wilderness, coughing up blood as he struggles to focus on his Inuit comrade Kataktovik. The narrative shifts backwards to show “Bob” Bartlett prepares to captain the ship Karluk on its exploratory expedition to the North Pole. Bartlett proves himself a salty captain, bristling against the inclusion of scientists on his ship and the grumbling of his crew. Still, Bartlett also proves himself astute, as the ship rapidly descends into a “powder keg” of tension and dissent. It’s here that we meet Fred Maurer, an energetic explorer who would brave the frigid north not just once on the Karluk, but a second time as well, in the company of the next narrative’s protagonist, Ada Blackjack, an Inuit single mother trying to scrape up enough money to feed her sickly son. We first encounter Ada in 1921 as she rummages through a seemingly abandoned camp beneath a stark red sky. When Ada finds her lost cat, Vic, a small, relieved smile creeps across her lined face. But her joy is short-lived. With a menacing “MOOAARR” that hangs in shaky black letters above Ada’s head, the source of her own troubles is revealed: a polar bear in the camp, towering over her tiny frame. Ada’s inclusion in the text is a tricky one. The real Ada Blackjack lived a hard life, and she returned from the Wrangel Island expedition to find her tale of perseverance and survival exploited in a media circus, her rescuers profiting off her story while she continued to live in hardship. Healy does not exploit, however, but rather empathizes with this Inuit woman trapped in an increasingly white world, doing what she can for her ill son. Meek, small, and constantly worried, Ada is hired onto the expedition as a simple seamstress. However, as the expedition gets trapped on Wrangel Island, she transforms herself into a fierce and capable survivor. 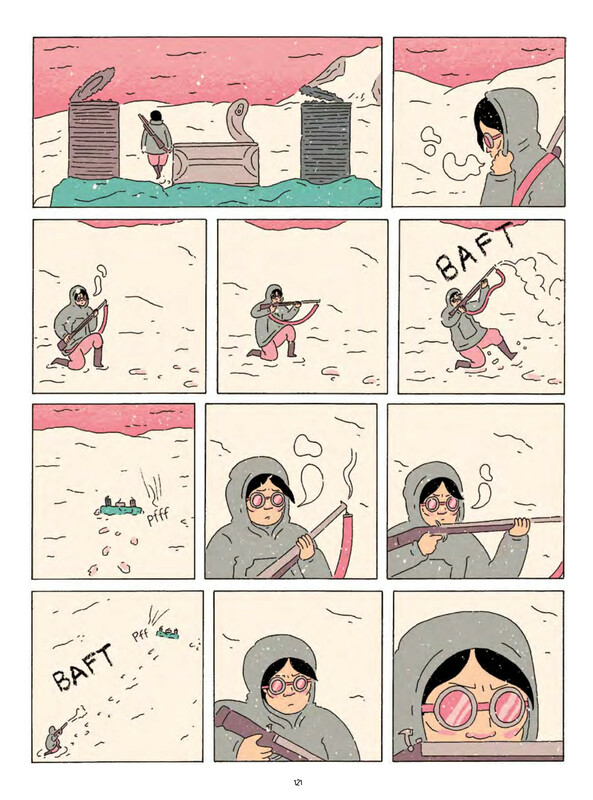 In a story filled with inspiration and heroism, few images stand out: Ada wears snow goggles red as the Arctic sky, clutching a rifle as big as her body, brow furrowed in defiance of her own meek spirit. It is perhaps as a foil to Ada’s inner strength and Bartlett’s endless stoicism then that we are introduced to Sullivan Barnaby, or Sully, as the text affectionately calls him. Sully is no great survivalist, at least, not in the wild sense established by the book’s other protagonists. Rather, Sully is a mild university professor, placed on mandatory sabbatical for what we soon learn is an illicit affair with a university student. Isolated from his colleagues by the scandal, Sully instead befriends the university librarian as he engages in research to occupy his mind. Stumbling on accounts of the two Wrangel Island expeditions, the separate narratives are woven together in Sully, a man who, despite his apparent softness, proves himself no less than a survivor in the frigid loneliness and dangerous ethics of a romance that could cost him everything. Through it all, Healy’s skill as a cartoonist sings. Rendered in soft but striking pastels, Healy’s art displays a certain charm normally reserved for children’s book classics, simple and gratifying and utterly remarkable in its economy. Still, this is no children’s book, and Healy’s art also displays a rugged minimalism that never fails to convey the stark situation of the book’s protagonists. Whether it is Bartlett slumped on the hard ground in a pool of his own blood or Sully laying on his couch amidst the materials of his depression, Healy uses comics conventions to stunning effect. Characters’ breath fogs up visibly before them, serving not only as a constant reminder of the bitter cold, but also playing at speechlessness and deafening silence, each frozen breath resembling a shriveled, empty speech balloon. 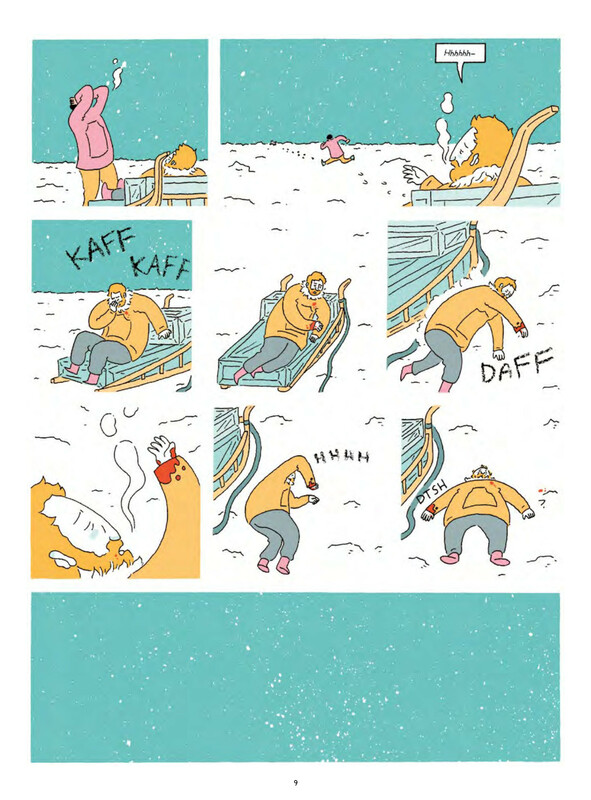 Sound effects don’t just offer sound, but take up space within the panel themselves, so that the staccato “KAFF KAFF” of a dying man’s cough almost threatens to crush Ada Blackjack as she tries to sleep in her tent, and leaves an unbearable emptiness when it suddenly stops. Healy’s real skill as a cartoonist, though, is the masterful way he blends all these elements into a book that is both thrilling and artfully constructed, exploring death and despair, but also those moments of bravery and human triumph. For all its narrative weaving and cleverness, How to Survive in the North tells a good story. Bartlett and Blackjack’s respective expeditions will appeal to readers’ sense of adventure, presenting an established history in a thrilling new light, while Sully’s modern woes provide romance and quiet drama that resonate heavily throughout the text. Ultimately, How to Survive in the North proved itself a fun and addictive book. Whether you’re lost, lonely, and looking to survive or just simply want a fun, charming romp through the wilderness, you can’t go wrong with How to Survive in the North. Julia Mae Ftacek is a writer living in Michigan. Her work has appeared in Literary Orphans, Dirty Chai, and Blue Labyrinths.